The Ijaw leader, Pa Edwin Clarke in an interview with the cable, called on the Nigerian federal government to re-arrest the leader of the Indigenous People of Biafra, Mazi Nnamdi Kanu. The Ijaw leader was quoted to have said: “There is no way youths can take over the administration of a place and it is very irresponsible for Kanu to say there will be no election in Anambra State come November, 2017”. 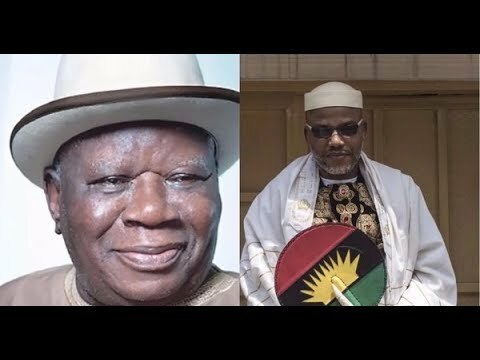 The above statement drew the attention of the supreme leader of IPOB, Mazi Nnamdi Kanu who went on to remind Elder Clarke that all the blood of the innocent Biafrans murdered in cold blood by the agents of the Nigerian government and the insults he Kanu receives on a daily basis are all to set him free, as old as he is, from slavery because Biafra will be an epitome of freedom. Elder Clerk is an Ijaw man, former Nigerian Minister of Information under Yakubu Gowon. Elder Clarke having worked and still working with the Nigerian federal government, has not noticed the wrong structure in the Nigerian system which is structured to the detriment of the future of his region. He is probably blind to that ill structure because of oil allocation and other settlements he receives from the government of Nigeria. The Elder has not noticed the level of poverty, sufferings, molestations and unemployment in his region because he doesn’t want to lose his influence and accumulating wealth in the Hausa-Fulani owned Nigerian government. The old man sees nothing wrong with his people living in swampy areas, without electricity, proper drainage system, social amenities, schools and good roads because his own family is comfortable. He really doesn’t care if Ijaw people in his region use the same water they defecate in to cook but he is concerned about how much money is flowing into his pocket. It is on this background that the leader of the Indigenous People of Biafra left his comfort, work in the United Kingdom, to fight for the liberation of Ijaw region. Thus, if Elder Clark loves Ijaw people like Nnamdi Kanu loves Biafrans, he should plan on how to leave a legacy of freedom of expression, worship and 100% control of their resources, which can only be possible in a restored Biafra. If not, Elder Clark should be aware that he is leaving a legacy of betrayal and sale of Ijaw’s birthright to Hausa Fulani for Ijaws to remember. them 13% of what rightfully belongs to them, meaning that Biafra restoration is mainly to benefit and liberate Ijaw from being a slave in their father's palace because an average Igbo Biafrans is industrious and needs no oil from Ijaw land to survive or earn a living. Therefore, Elder Clark and his likes should think deeply when making a statement about Biafra and ask questions for clarifications before coming out to the public to make unnecessary statement that will put their respect at bay.